Prestigious award recognises outstanding contribution to science and technology. At a ceremony held in New Delhi on 25th January, City's Professor of Structural Dynamics, Professor Ranjan Banerjee received the 2015 Hind Rattan Award. This prestigious award, which recognises outstanding contribution in the recipient's field of research, is granted annually to 25 non-resident Indians (NRIs) worldwide by the NRI Welfare Society of India, an organisation that is under the umbrella of the Indian Government. 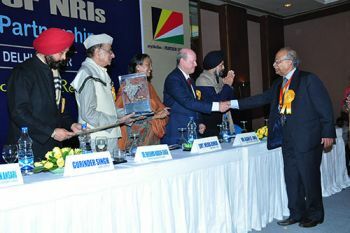 Professor Banerjee received his award during the Society's annual congress attended by senior members of the Indian Government and the Supreme Court of India. Professor Banerjee, who became a Fellow of the Institution of Structural Engineers in 2014, is pleased to have been recognised with the Hind Rattan Award: "I am honoured to have received one of India's highest diasporic awards and to have joined other awardees from around the world who have distinguished themselves in various fields of endeavour. I am delighted too, that the Hind Rattan Award will draw attention to City and the work I have been involved with here over the last three decades." Structural engineers design, create, solve problems, innovate and use maths and science to shape the world. The structures they create are used by all of us every day; from houses, theatres, sports stadia and hospitals, to bridges, oil rigs and space satellites.